Most standing seam products are produced on portable or light weight forming equipment that is prone to going out of adjustment or having frequent wear that causes problems. 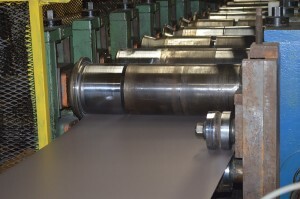 Our manufacturing process is far different from many other vertical seam roofing producers. 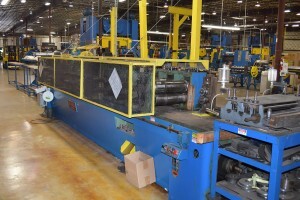 Heavy duty roll former with tooling specially designed and built by Isaiah Industries. ClickLock standing seam is produced from our state of the art 110,000 square feet manufacturing facility in Piqua, Ohio. 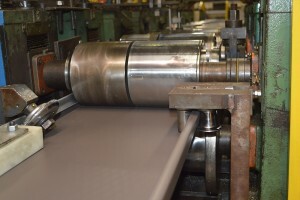 The machine is a heavy duty roll former with tooling specially designed and built by us. Our experienced operators consistently check to ensure the panels are formed properly so that they will interlock together simply and securely. Our average length of team member employment exceeds 15 years, so you are assured of the highest quality. 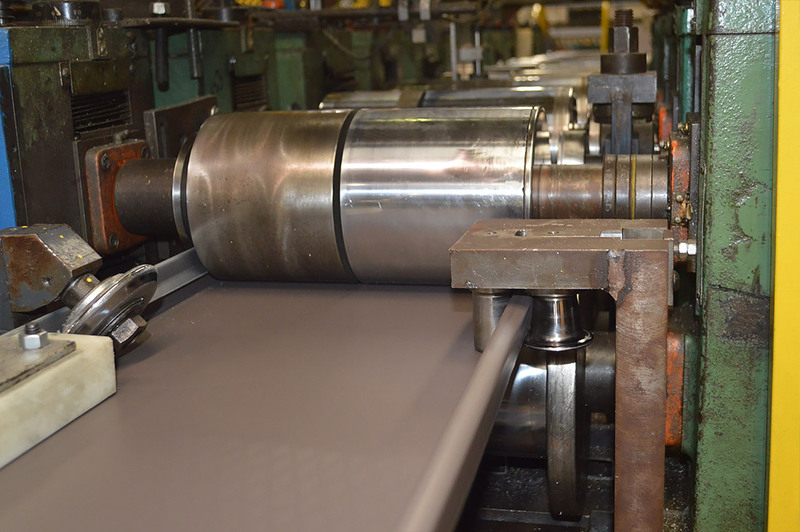 Quality PVDF-Coated American-made aluminum alloy entering our heavy duty roll former for ClickLock production. Continuous coil-fed ClickLock production line ensures precise, consistent panel formation for installation ease and wind resistance. 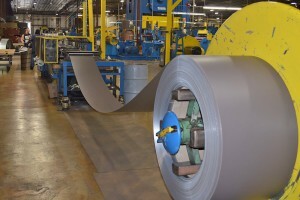 Precisely and exactly formed standing seam panels exiting the roll former and going into the cut-to-length operation. Our lineal trims are produced in our CNC press brake cell. The use of press brakes allows us to custom-fabricate parts that you need. It also allows us to make ridge, hip, eave, and other flashings specific to match the pitch of your roof so that you do not have to force things to make them fit. The manufacturing process really starts with, and is heavily dependent upon, the measurements and other information that you supply. We will work closely with you though that process until we are confident that we have the information to provide everything you need for the roof, and guide you to a successful project completion. With years of experience and craftsmanship, we can meet your needs for a ClickLock DIY roofing system, or the supply of coils only to contractors. For more information on our manufacturing processes, contact our team support specialists. 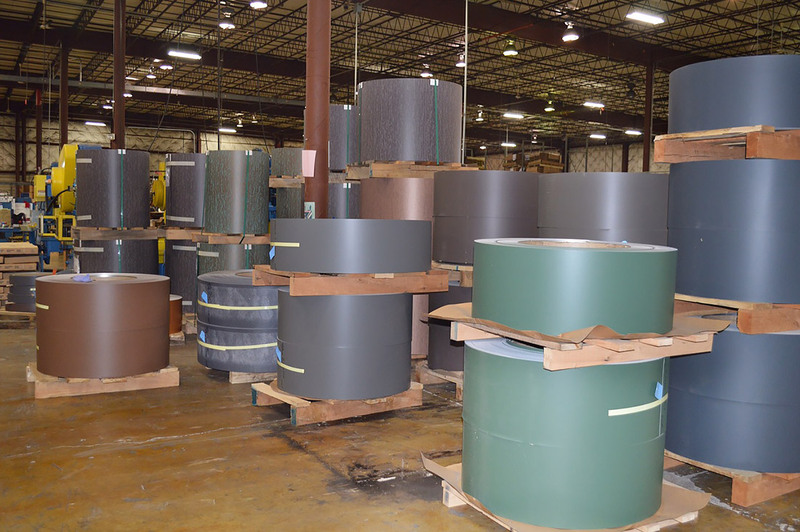 If you are a contractor seeking .032” thick aluminum coil with a PVDF finish for your own fabrication, please let us know your needs. We can provide coil as wide as 48”. Many contractors rely upon us as a dependable source for standing seam aluminum coil stock.